We are Bank of Scotland Enterprise Award finalists and are recognised by our local Chamber of Commerce as an “Outstanding performing Business”. Most recently, the chamber shortlisted us for an “Excellence in Customer Service” award. 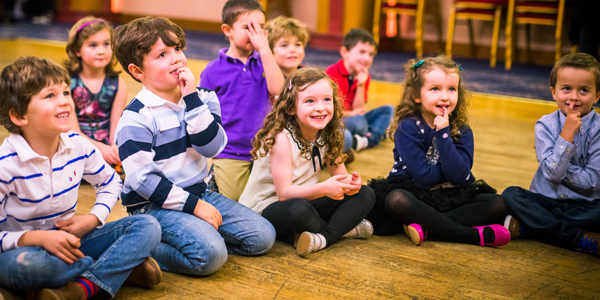 Our party is filled with cardio, drama, disco, comedy, parachute and party games. As children begin to develop their own hobbies and interests, it is important that we tailor a package to suit. We encourage you to request certain things that you know your little one will like. We will try our best to accommodate or at least tell you if the package is right for you. We work with children aged 4 to 10. Sadly 0-3-year olds just don’t have the attention span for what we offer – a fact that we are up front about. We travel around central Scotland and have a small team in north west London. Please feel free to enquire about your area as we love traveling when possible. To answer a popular question, our name is essentially a play on “kinetic”; an adjective for active, lively, dynamic or energising. The one connotation that kinetic doesn’t depict however is “control”. We truly believe that maintaining control of the room is vital, despite wanting to create the fun filled party atmosphere. 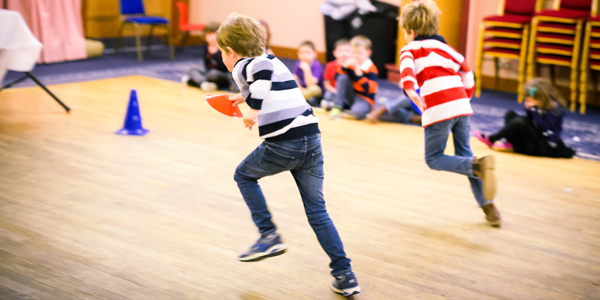 With that control, you can steer the kids towards a lively and energetic party. For more information, please visit our Prices page. Kidnetick entertainers are PVG checked by Disclosure Scotland and are fully insured. My name is Josh and I am the Owner, the original Kidnetick Entertainer and the guy that our logo is supposed to look like. I know that I don’t have that muscular physique and can’t imagine my hair staying as substantially thick as the years go on. I tend to answer the bulk of the phone calls and enquiries myself in case you wonder who you’re dealing with when you get in touch. I hope in reading this personal blog you will understand that Kidnetick is not something corporate but a small business built with passion, experience and a genuine love for the job. Kidnetick ultimately started while I was still living with my mum and sharing a room with my brother. At the age of 16, my first job involved working for a local leisure club in Glasgow’s south side. They explained that I would be trained to run their sporty parties. I had a passion for fitness, dancing and all things Peter Sellars, Robin Williams and Monty Python. As such, I loved not only running these parties but began treating them as performances. The result: kids laughing, exercising and building self-confidence. To top it all off – the genuine appreciation from parents was a huge motivation. Over the course of a 5-year period I would run the sports parties but would integrate an element of comedy and disco. Throughout this time, I became involved in a variety of summer camps and children’s afterschool clubs. My repertoire of games had grown extensively, as had my knowledge of childcare. Running in tandem with all the above, I managed to gain work as a freelancer on shows such as the ‘The X-Factor’, ‘The Eurovision Dance Contest’, Jimmy Carr’s 2010 Stand up – as well as factual documentaries. This stood me in good stead as I went onto graduate with a first-class honours degree in Media and Communication. I have found over the years that having this other skillset has helped tremendously. It led to becoming a tutor in camerawork and editing at Glasgow Caledonian University; a job I still have and enjoy part time. After finishing a media internship in November 2011, I decided it was time to start Kidnetick. I figured that while I look for a “real job”, I would attempt to start the business. Up until that point I had visualised a career as a freelancer in the media world. I had zero interest in the concept of running a business – all I cared about was taking what I knew and delivering the best party possible. What I did not anticipate was that down the line I would be training talented individuals to deliver the parties to cope with the demand. Prior to taking on other entertainers however, I had to drum up business. I was six months into the business and my bank balance was not looking very healthy. However, I had not long turned 22 – an age where you feel invincible. My relentless enthusiasm for what I was doing somehow caught the attention of major retailer Hamley’s. Hamley’s wanted “Kidnetick” to come in and run workshops throughout their holiday periods. When shaking hands with the events manager in agreement – I didn’t have a website or a logo. Nothing speeds the branding process up better than a major retailer asking you to send your company details over to their marketing department. Regardless, with Hamley’s taking me on, Kidnetick suddenly had credibility. Over the next few years, after school clubs and hotels took interest, which lead to schools and nurseries far from home getting in touch. However, it was the weekend birthday package that I had been refining that proved most popular with parents. I cannot express properly how much I love delivering those parties. Making kids laugh and keeping them active is such a thrill. I think it is that genuine passion that convinced some of the most talented guys and girls I have ever met to come on board. Over the last few years, trainee primary teachers, actors and many other naturally talented individuals have shadowed and trained with me. Every new team member has come with their own flare and experience, which has taken the Kidnetick concept in directions I never thought possible. Over a four-year period, I began managing entertainers and coordinators, while teaching and of course running parties myself. I aimed to keep myself in shape much like a sportsman/athlete, but I’m not quite as genetically advanced. All I really mean… I learnt quickly that you need to eat very well and exercise to maintain such an active lifestyle. On a personal level, I got engaged and married to my childhood sweetheart during this early period in the business. We had been together for 11 years before getting married. Eventually we bought a house far from work – a choice that would lead to commuting sometimes 3 hours a day to get to and from work (we did have our reasons). It was inevitable that after several years of running at quite a pace, I picked up a virus. For me it came in the form of an ear infection. Despite bouncing back to work, I immediately started hosting large school events and birthday parties intensively. During one such event, everything was going according to plan, the kids were behaving – everything was in full swing. Out of nowhere however I had to fight to stay on my feet. My legs went like jelly, the dizziness was horrific. This was a feeling I had never experienced – certainly not halfway through an event that was going very well. Don’t ask me how, but I managed to get through the rest of the party while trying not to pass out. This feeling would then plague me for about 4/5 weeks before going through heart monitoring, brain scans, ENT, Neurology and many blood tests. All it was – an inner ear issue, which has since caused migraine issues, chronic fatigue and balance problems when working. For the best part of a 14 months I tried to go back to running parties. However, the symptoms were just horrific. The more I tried, the worse they got. You can imagine the anxiety of feeling both off balance and faint in front of crowds heightened the physical symptoms. After a year of trying to push through, I decided that I really need to step behind the scenes and take more of a managerial position. That epiphany came as I realised I could hardly muster the coordination to iron the uniform let alone run a party. This rather unexpected period started in Nov 2016. I’m writing this almost two years later. 2017 was tough – desperately trying to conjure the energy to perform but to no avail. However, in completely stopping the physical aspect, I have been able to focus on staff development, customer care and our plans for the next few years. I very much hope to go back to hosting myself! I am 70% back to normal I would say. Some days I feel better than I felt before I took this turn. It’s only when my body reminds me that I’m not back to normal that there is a reality check. I’m very fortunate as there are hundreds of chronic and acute health conditions far worse. This juncture has taught me to put health before anything else. However, my passion for Kidnetick as a service has never been stronger. That dedication to creating the best package possible for you as a parent hopefully shines through. I am incredibly lucky because that enthusiasm is shared by all my colleagues. It is because of their talent and passion that 2018 has been one of our busiest to date. I want to end this with a thank you. I thank the parents, schools, nurseries, colleagues and the kids that have helped Kidnetick grow the way it has. Your support is crucial to our development and I will continue to put 100% into making sure we deliver the service you truly deserve. Where it all began….Click here to find out more.